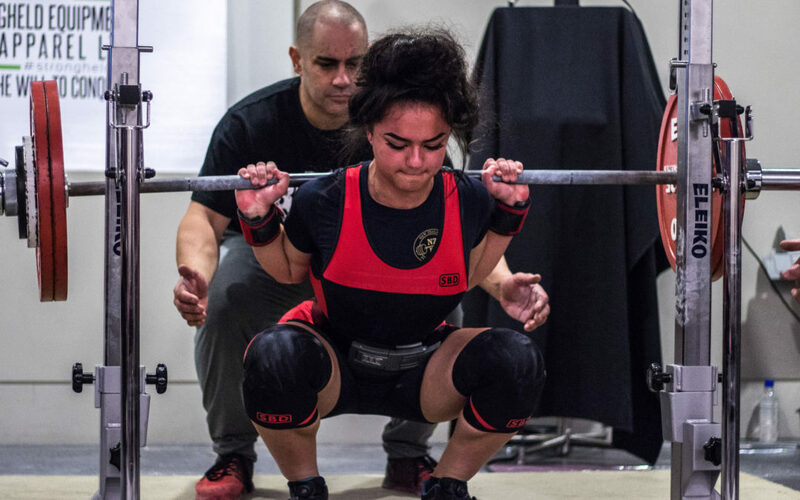 The final preparations are in full swing for Wairarapa College student Katia Mackenzie as she heads towards the 2018 IPF World Classic Powerlifting Championships in Canada. At the weekend Mackenzie completed her final competition before the major event, setting a host of New Zealand records in the process. The Central Districts Powerlifting Championships in Hastings was the scene of her feats, as she competed in the sub junior under-18 category. She completed a 135kg back squat, 70kg bench press, and 150kg deadlift, all of which were New Zealand records. With only six weeks until the world championships, Mackenzie knows she is in a good place. “I was pretty pleased with all of the lifts,” she said. Mackenzie has only been powerlifting for about a year, and her rapid progress has been remarkable. She had set herself a goal of reaching the world championships when she first started, and in a few weeks she will reach that target. “That comp (CD championships) was kind of just like a tester to see where I’m at, and I feel like I’m in a pretty good place. The excitement has been steadily building for Mackenzie since March, when she received her official invitation to represent New Zealand at the world championships. She trains about five times a week, and knows the hard work will be worth it when she steps onto the stage at the global competition. “It’s pretty awesome that it’s so close now. It was still too early for Mackenzie to set herself any particular goals for the event, but she was keen to make the most of the experience. “It’s a bit hard to say — I just want to do my best I guess. This year marks her final year in the sub junior under-18 category, but she already knows what is required after breaking all the records in the class last year. She will be the fifth person from Wai Weight Gym in Masterton to attend the world championships, and others from the gym also impressed at the Central Districts Championships. Kieran Obrien, Jesse Russell and Jacob Cooke-Tait also produced impressive displays at the event. A quiz night fundraiser will be held next month to help secure the funding needed to send Mackenzie on her journey, but right now her attention is firmly focused on completing her training before the biggest event of her career.